We have recently been asked several times to re-post this. And yes . . . this practice has been nothing short of fantastic for all of our clients who initiate this at their event . . . When your photos come back from your wedding photographer, all your guest shots include your favorite people staring at their favorite devices. People are smiling, but they’re all staring at little screens. 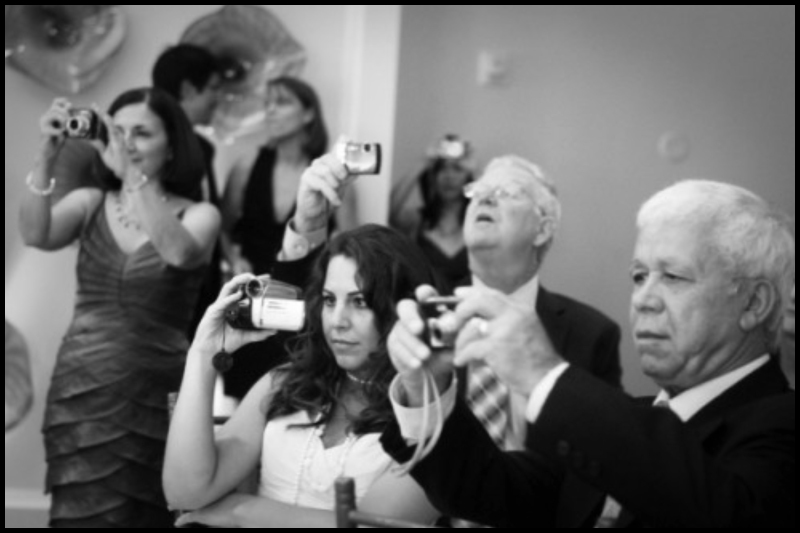 Welcome to the era of the over-documented wedding, where, even if you’ve hired someone to take photos, every guest has a camera and an iPhone and is tweeting the whole event. They’re there with you, but are they really present? As a web nerd who spends the majority of my life plugged in, even I think it’s critical to take a few moments to be truly present. While many churches have no camera policies, I’m hearing more and more from nontraditional secular couples that they’re considering an unplugged wedding — at the very least, asking guests to turn off their devices during the ceremony. Now, let’s acknowledge that a fully plugged-in, hyper-documented wedding makes perfect sense for some couples. Micro-budget brides sometimes skip professional photography, opting to rely on guest photographs — so of course guest cameras make perfect sense in that context. If you’re a digerati who announced your engagement via Facebook, had an iPad-wielding officiant, read your vows off an iPhone, and live-streamed your ceremony, then there’s no reason you should unplug your wedding. I’m certainly not here to dictate that anyone needs to have less tech at their wedding. How can I connect with my guests when I can’t even see them through the cameras they’re holding up? 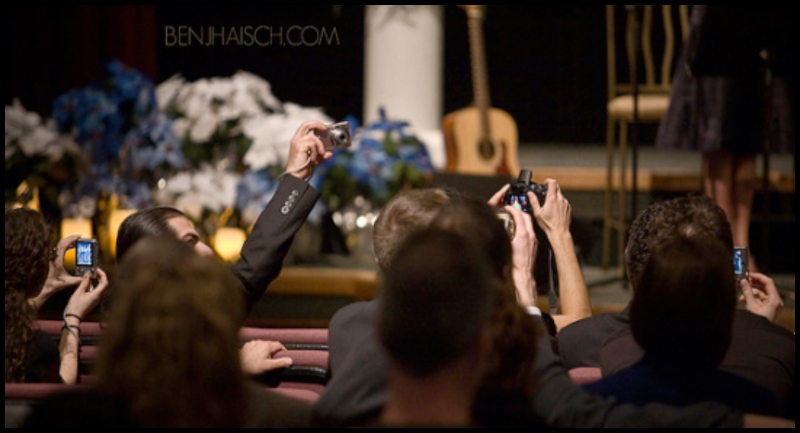 You don’t have to look very hard to find a million rants about how Uncle Bob has ruined professional wedding photos with the flash from his camera, photobombing gorgeous poses, kneeling in the aisle blocking the view of the vows, and even standing on pews. 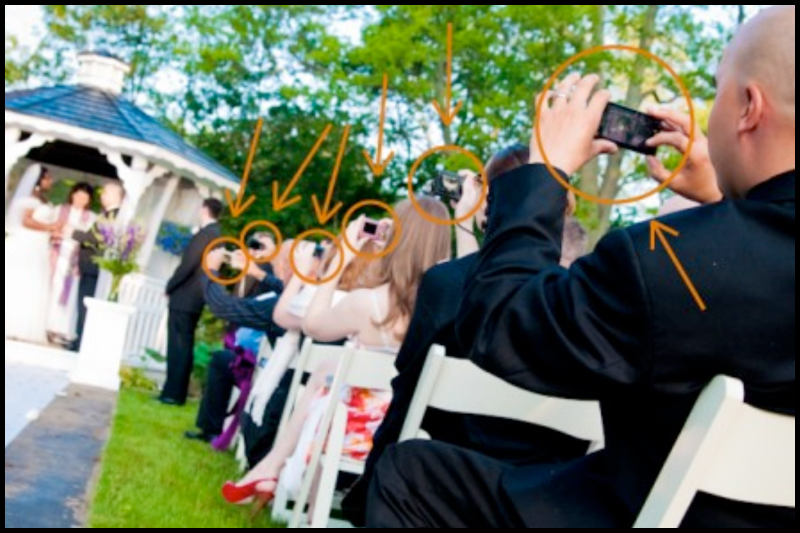 I want to clarify again: I’m certainly not saying that all weddings should be unplugged, or that guests are doing anything wrong when they have their cameras and phones out. If it doesn’t bother the couple, then it’s not a problem. As with all things Offbeat Bride, ultimately this wedding decision comes down to what feels right to each couple. That said, I do think that in this era of 24-hour connectivity, where there’s an iPhone in every pocket, a Facebook status update in every encounter, and a digital hobbyist photographer in every family, it’s important to carefully consider the issue. Digital devices are ever-present in our daily lives; what role do you want these devices to play at your wedding? If this is important to you, please feel free to consult On the edge Weddings about this. We have a few ways that have worked very well in the past. In so doing, it makes our job far easier and lets your family, friends and guests actually ENJOY the wedding . . . the way you probably want it, and in our opinion, the way it should be. 25 Nov This entry was written by Deke, posted on November 25, 2011 at 9:11 am, filed under OTE News, Rain. Bookmark the permalink. Follow any comments here with the RSS feed for this post. Post a comment or leave a trackback: Trackback URL. Older: BLACK FRIDAY – Client Appreciation Day . . . Newer: Davenport FotoBooth . . .